Karimnagar: There are two reasons why the ruling Telangana Rashtra Samithi (TRS) could overcome the arithmetic advantage of the opposition. The first is the personality cult of Kalvakuntla Chandrashekar Rao, or KCR. 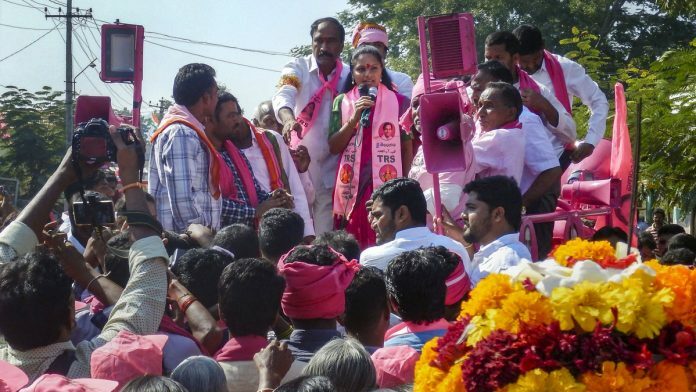 The party’s prospects have looked up as KCR has gone around from one constituency to another, exploiting his mass connect, his status as the only pan-Telangana mass leader as his coarse language turns rally crowds uproarious. Is he a Modi-like orator? “Much better,” some Telugu speakers will tell you. “Much worse,” others say. Both mean the same thing. This alone can’t save the TRS. Ask anyone who says they are voting for KCR or TRS why they plan to do so, and the answer would be one of these three: Shadi Mubarak, 2 bedroom, Rythu Bandh. These are just three of the better known populist schemes of the TRS government. The full list is endless. Shadi Mubarak gives more than Rs 1 lakh to women when they get married — the amount was recently raised from Rs 75,000. Shadi Mubarak is the name of the scheme for Muslims, the equivalent for Hindus is called Kalyana Lakshmi, but many Hindus also call it Shadi Mubarak. The double bedroom scheme was a promise in the 2014 manifesto of the TRS. The promise hasn’t been kept yet. Nevertheless, lakhs of poor people hope to get a double bedroom house soon, kitchen and toilet attached. The hope and aspiration of getting a 2BHK is making many look forward to another term for then TRS. Keeping alive the hope are many incomplete houses you can see on your way from Hyderabad to Karimnagar, especially in the chief minister’s own constituency of Gajwel. Rythu Bandhu is an “investment support scheme” for farmers that gives them Rs 8,000 per acre every year, helping offset farm distress. The only problem is that it goes only to landowners whereas most farmers are tenant farmers. Yet even the tenant farmers are happy about something or the other: Shadi Mubarak or the promise of a 2BHK among them. Water has started reaching the farmlands through ambitious irrigation schemes, including the flagship Mission Bhagiratha, but they have a long way to go. Pension schemes are not limited to widows and the elderly. If you are a toddy tapper, a weaver, a beedi worker, or just a single woman — the TRS government either gives you some monthly ‘pension’ or promises to do so after winning the election. The populist schemes mostly try to put hard cash in people’s pockets, though sometimes you also get economic assets at subsidised rates. Targeting caste groups through their caste occupations: Buffaloes for Yadavs, sheep for shepherds, and fishing nets for fishermen. Since the TRS has repeated almost all its sitting MLAs, it faces the problem of anti-incumbency. 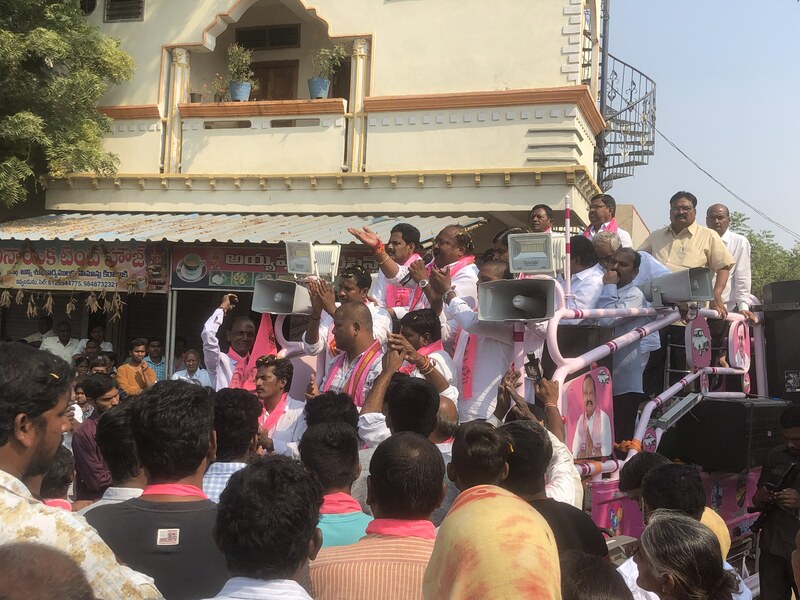 In Karimnagar town, the sitting MLA campaigns on a path painted pink in the official colour of the party. He explains each and every scheme in great detail, promising the amount would increase after the party is back in power. In case the Congress wins, he warns, they’ll take away all these schemes and benefits. In other states this election season, such as Madhya Pradesh and Chhattisgarh, rural distress has reportedly been a major issue. So is unemployment, because when the farm is unviable people tend to look for jobs. In Telangana, one relatively hears less about these issues, even though the TRS didn’t keep its promise of creating 1 lakh government jobs. The Karimnagar MLA may still have a problem winning his seat, because urban Telangana isn’t as enthused about the schemes as rural. If you remove the large metropolitan capital of Hyderabad, expanding as it is in all directions, then Telangana is mostly rural. The urban elites in district towns are not as vocal in their support of the TRS. In Karimnagar town, one vegetable vendor says he will vote for TDP-Congress because he’s been a traditional TDP voter, never mind that the TRS government gave him a free transport vehicle. A pan shop owner says he applied for a double bedroom but his application was rejected, so he’s not a KCR fan anymore. Traders and shopkeepers say the TRS has made no difference to their lives; many of them are inclined towards the BJP. Scepticism towards populist schemes and freebies, especially when they are given just before elections, has become commonplace. Ashok Gehlot in Rajasthan in 2013, Akhilesh Yadav in Uttar Pradesh in 2017, and Siddaramaiah in Karnataka earlier this year are some examples of incumbents who lost despite distributing populist welfare schemes. Telangana could be different. This was the poorer part of Andhra Pradesh. Economic inequality between Telangana and Andhra regions was one of the main reasons for the Telangana agitation. Among the opposition Congress’ allegations against the TRS has been of making Telangana a debt-ridden state. This is true. The state’s ratio of debt to Gross State Domestic Product increased from 12.7 per cent in 2016-17 to 22.2 per cent in 2017-18. In March this year, the total debt stood at a whopping Rs 1.8 lakh crore. The rise in state debt as elections came closer is a reflection of how it has pumped money into the poor rural hinterlands. KCR has used this money to give 24×7 electricity and build roads, as much as giving people cash to alleviate the burden of dowry or support farm incomes. The pumping of money into the rural economy has reflected in an increase in the state’s per capita income and agricultural growth, both of which have received a boost since the creation of Telangana and the TRS government coming to power in 2014. If the TRS wins this election despite the coming together of the opposition parties in a grand alliance, it is this debt that will be responsible.